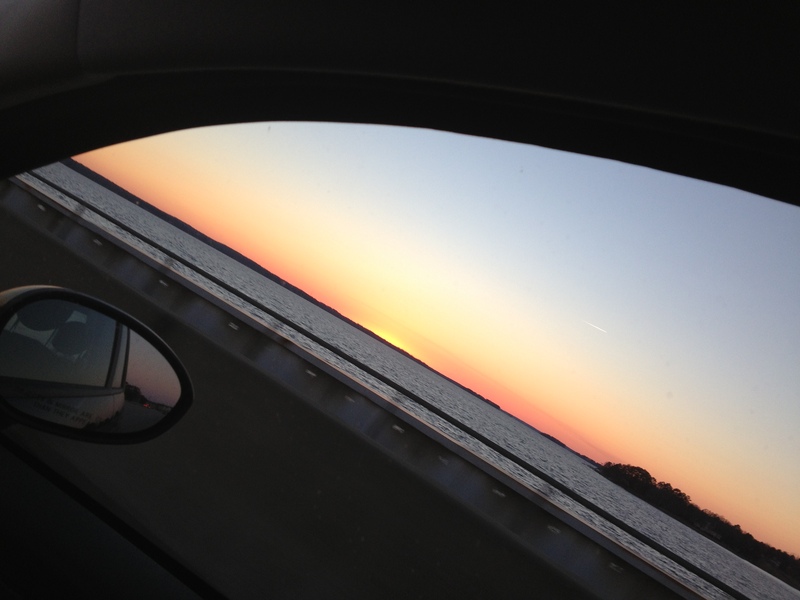 I’ve mentioned before that the highlight of my long commute to work is crossing the beautiful Lake Murray dam. Some (all-too-early) mornings I witness the mystical moon glow across the water. Some mornings I get to lay eyes on incredible sunrises that would take your breath away, and the crown glory of a long hard day of teaching…being audience to an out-of-this-world sunset as I finally make my way home. Today was a day in which the weather decided to taunt us all with the riches of Spring. Only last week the ground was covered with snow and yet today the temperature hit the 70s. 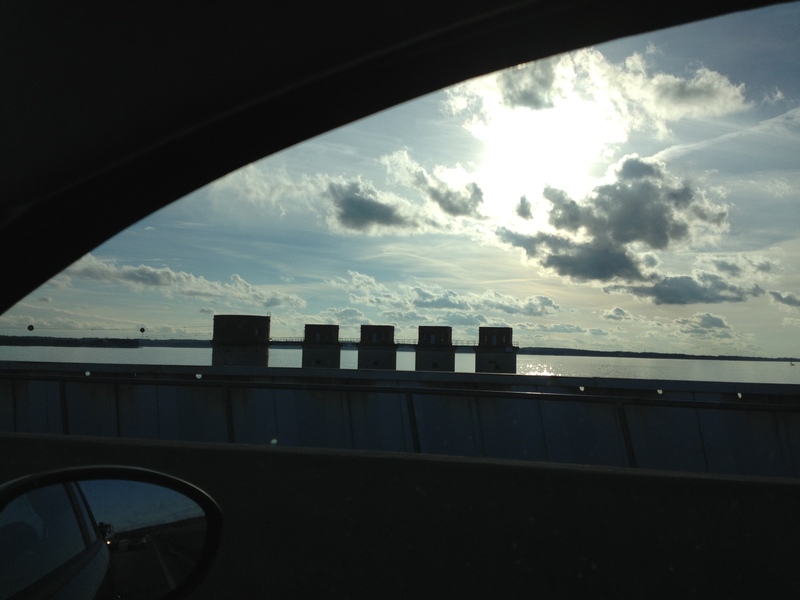 So crossing the dam this afternoon on the way home was like a mini spiritual journey. The lake was right there, beaming in all its glory as the setting sun was bouncing its warmth everywhere, creating a spotlight on what seemed like a mirage. And the mirage said to me, “Hang in there, summertime is a comin’!” And am I ever ready!!! Knowing I had a blog entry to write, my journey crossing the dam today, the tease of Spring inspired me to write about this impressive SC state treasure. I came across some fabulous information about the history of the Lake Murray Dam that I just have to share. “Lake Murray is named after William Murray, the engineer who, with his partner T. C. Williams, conceived and persevered until “the world’s largest earthen dam” at that time was finished. Their vision of harnessing hydroelectric power here and at the Santee Cooper project brought abundant electricity to the middle part of South Carolina. Work on the dam across the Saluda River was started on September 21, 1927 and was finished on June 30, 1930. During construction of the dam, a Movietone news crew filmed the construction, and the newsreel footage has been preserved at the University of South Carolina. The dam itself was built over 200 feet tall. It runs a distance of a mile and a half across. The ground level of the dam is over a quarter of a mile thick. The lake that it forms is forty-one miles long and, in places, over fourteen miles wide. State Highway 6 runs along the top of the dam, giving a panoramic view of the water on one side and the layout of the SCE&G Power Plant below. “Approximately 100,000 acres of land was purchased for the building of the dam and lake. Land was purchased from more than 5000 families. The land sold between $15 and $45 an acre. To make room for the lake, nearly a dozen communities had to abandoned, including Derrick, Pine Ridge, Selwood, Wessinger, Cantsville, Leaphart, Savilla, Boyleston, Lorena, Holly’s Ferry and Lorick’s Ferry. Six schools, three churches and about 193 graveyards containing 2,323 graves had to be moved. Some families chose not to move the graves, and at several area churches there are monuments with these names listed. As a child, I remember stories of my father and grandfather diving off of the towers. In high school, rebels would spray paint messages on the towers. I remember riding on wave runners with high school friends and falling off into the water right at the towers one time. Let’s just say, I completely freaked out! I had visions of catfish the size of a bus snapping up to swallow me whole! I couldn’t get back on that wave runner fast enough! 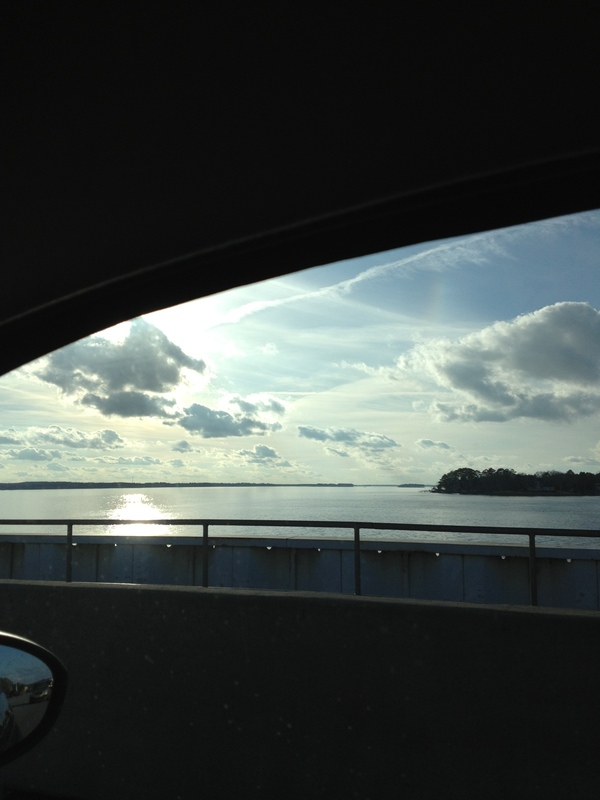 Crossing the fabulous Lake Murray dam every weekday reminds me that growing up on Lake Murray was and is pretty darn special and I’m certainly thankful for the opportunity to be reminded of its glory each day on my trek to teach. This entry was posted in Midlands, Shannon Boatwright and tagged Columbia, columbia sc, every woman blog, Famously Hot, hospital blog, Lake Murray Dam, Lexington, lexington medical center., lexington sc, Lexington Women, lmc, LMC every woman blogger, Midlands, Midlands Women, shannon shull, South Carolina, South Carolina Women, Women, women's blog, women's hospital blog by Kate Gillmer. Bookmark the permalink. Right out of college, I worked at Lake Murray Tourism and Recreation Association, now Lake Murray Country. Such a great first job. 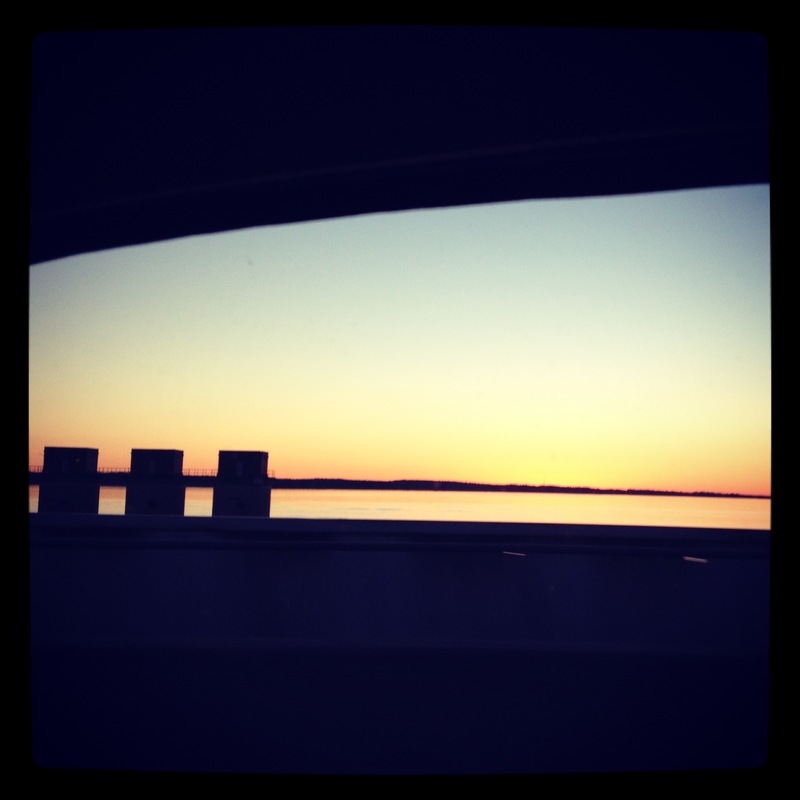 I loved learning about Lake Murray and being out there every day. Beautiful place.